Spectacular river front home for rent! Immaculate, fully stocked and fun ready with all the contemporary necessities for comfortable lodging, dining and entertaining. Secluded, private balcony with breathtaking views. Fabulous fishing in the river right below your home. Nearby hiking trails, mountain biking, rafting, waterfalls, cave art, exploring and world famous Crater Lake. It's all here! Gorgeous. Stunning view. You can hear the river throughout the entire place. The rental was fully stocked with everything we could need PLUS some. The owner seemed insistent on meeting us in person... which is fine, but sometimes can feel like a small invasion of privacy. The surrounding area was marvelous. The hot springs were our #1 goal, but the road was closed due to trees falling so the hike grew from .5 miles to 2 miles to GET to the springs and the trail head was mobbed with sketchy campers, so we stuck to several waterfall hikes instead. There are easily 20 hikes of varying difficulty within 45 minutes. We also had one day where we never left the rental... the river location and rock outcropping are a magical spot to sit and relax. Again, we'll be back! I grew up in Glide, but moved away 20+ years ago after high school. My husband and I were looking for a spot to stay and bring our two kids (ages 9 and 6) for the weekend to explore the area. This was the perfect spot. The view was amazing and the house was really cozy. On the first morning, we were lucky enough to have a huge bald eagle fly up the river and then land in a tree. We loved watching him hunt from his perch. As much as would have liked to NOT do work while I was there, it was inescapable. Randy had just installed the high speed internet and it was awesome. I guess if you have to work, looking out at that river view is the best possible spot. Highly recommend River Vista Homes. We stayed in the "Maple" unit. It exceeded our expectations in every way. Nice, clean, plenty of space and quiet. We had a great view of the river below. Owner/host very accommodating and helpful with information and suggestions for local points of interest. We plan to return when we can stay longer. Over the top, much better than staying at a motel. 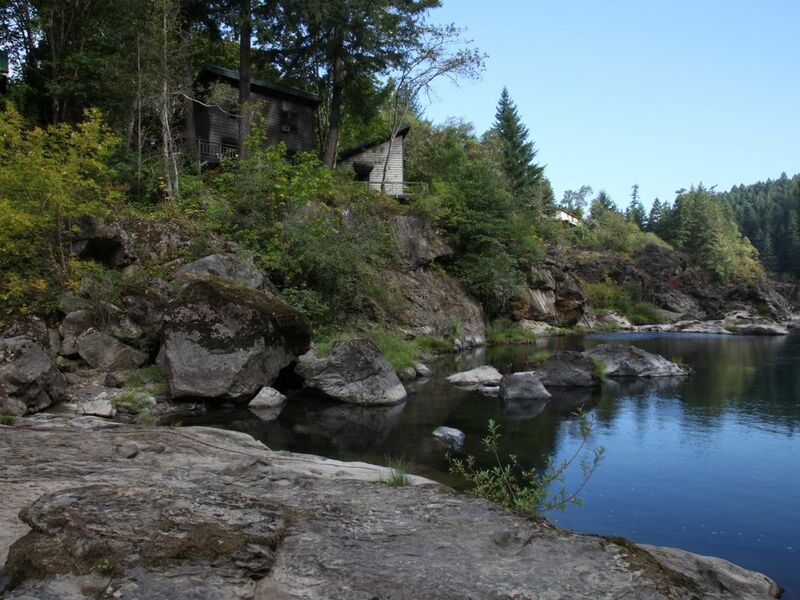 These three homes on the North Umpqua River are the closest to nature you can feel. The water is the best flowing part of the river and there is always something wonderful to watch as the water flows by and you sit on the deck. Otters, Eagles, Fingerlings... The walk down to the water is fun and Turtle Rock is great for fishing or playing. The inside is furnished with things you don't think about coffee filters, butter, creamora, CD player and favorite CD's, night lights, et al. Randy definitely goes beyond helpful. 5 Star for sure! Go and enjoy yourself, you deserve it! Beautiful view, cozy home, & great deck! House was great, the owners were so nice and helpful. They even let us know about falls near by...next time when we have more time. We will be back for sure! This is a lovely home overlooking amazing natural beauty. It was very peaceful and so relaxing to sit outside on the balcony. Randy was great to work with and very accommodating. Only issue we had was that we blew a fuse when I turned on my hair dryer and couldn't find the fuse box to fix it and felt it was too late to call Randy.